Guardians of the Galaxy is a new science-fiction/comic-book movie directed by James Gunn. It is based on the popular Marvel Comics superhero team and marks the tenth installment in the Marvel Cinematic Universe. This film features an outstanding ensemble cast starring: Chris Pratt, Zoe Saldana, Dave Bautista, Vin Diesel and Bradley Cooper as our five primary heroes as well as Djimon Hounsou, John C. Reilly and Glenn Close in supporting roles. As a massive Marvel fan this was probably my most anticipated film of the summer movie season. Guardians of the Galaxy totally went above and beyond my high expectations, making it one of, if not the absolute best Marvel movie to date. Early on in the film we are introduced to an American pilot named Peter Quill (Pratt) aka Star-Lord, who travels to the remote planet of Morag to steal a mysterious orb. Quill manages to escape with the artifact but his theft is soon discovered and a bounty placed on his capture. Eventually, Quill figures out that a villain named Ronan the Accuser wants this orb in order to abuse its power and rule the galaxy. In order to prevent this happening, Quill assembles a team of outlaws known as “The Guardians of the Galaxy”. 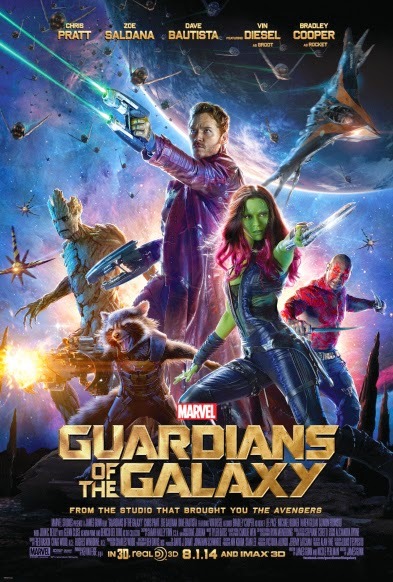 This squad includes ‘Star-Lord” himself, an alien assassin named Gamora (Saldana), a superhuman warrior called Drax (Bautista), a tree-like humanoid named Groot (Diesel) and a genetically-engineered raccoon known as Rocket (Cooper). Together, these extraterrestrial misfits must overcome their uneasy alliance so they can save our galaxy. First of all, Guardians of the Galaxy is definitely the funniest movie that Marvel has ever made. This film is loaded with quality, natural humor that is truly hilarious; with much of it coming from the incredible main characters. Speaking of which, those five heroes are some of the coolest, most interesting heroes that have been brought to the big screen in a long time. They were all equally awesome and unlike 2012’s The Avengers, there was nobody that really stole the show, (Hulk) which I think is very important for a superhero-team movie like this. Guardians of the Galaxy was completely entertaining from start to finish; loaded with mind-blowing visual effects and equally outstanding action sequences. This movie is just absolutely phenomenal; easily one of this year’s best films, one of Marvel’s best movies and in my opinion, one of the greatest comic-book films ever made.